The Type 052C destroyer (NATO code name Luyang II class, or Lanzhou class after the lead ship) is a class of destroyer built by China. It features a four array phased array radar for 360-degree coverage. The radar is used in conjunction with vertically launched HHQ-9 long-range air defence missiles. The Type 052C was the first warship in the People's Liberation Army Navy Surface Force to have true long-range fleet air defence capability. The design for the Type 052C was approved in September 2001. The chief designer was believed to be Zhu Yingfu (朱英富), the director of the 701st Research Institute of the 7th Academy of China Shipbuilding Heavy Industrial Group; Pan Jingfu (潘镜芙), the designer for the previous three classes, had retired prior to the approval. Two ships, Lanzhou and Haikou were constructed by Jiangnan Shipyard in Shanghai starting in 2002, and entering service by 2005. Production resumed at Hudong-Zhonghua Shipyard in Shanghai toward the end of the decade, with 4 more launched by 2012. There were six more ships planned after Lanzhou and Haikou. However, the hull of at least one planned ships was modified into newer Type 052D. The Type 052C used the same hull and propulsion as the preceding Type 052B destroyer, which had also been built by Jiangnan. While the Type 052B used a mixture of Russian and Chinese systems, the Type 052C used predominantly Chinese systems, with a few sensors being notable exceptions. The Type 052C was designed for the fleet air defence role, and mounted the Type 346 Active Electronically Scanned Array (AESA) radar, and vertically launched HQ-9 air defence missiles. It also carried YJ-62 anti-ship missiles. All three were new aboard Chinese warships. Aviation facilities included a rear hangar and flight deck for one Ka-28-A or Z-9 helicopter. The command and control system used by the Type 052C is unknown. Previous Chinese ships used derivatives of the French Thomson-CSF TAVITAC. The Type 052C may use an improved system to better engage anti-ship missiles, and to process data from its helicopter; the Ka-28 ASW helicopters must pass data back to its host ship for processing. While the Chinese claim to have produced combat data systems based on the MIL-STD-1773 standard, the Type 052C likely uses current standard Chinese systems based on the MIL-STD-1553B standard. The Chinese claim these are versatile enough to be upgraded to MIL-STD-1773 later. PLANS Changchun (150) in Butterworth, Penang, Malaysia in 2017. The Type 052C carries 48 HQ-9 naval air defence missiles in eight 6-cell 'cold launched' vertical launch systems (VLS). The Chinese VLS has a lid for each launch cell, but uses the same cold launch mechanism for each cell. This eliminates the revolver system used in Russian VLS, and one single point of failure. The Chinese claim this results in lower size, weight, and maintenance costs. The HQ-9 is a Chinese medium- to long-range, active radar homing air defence missile with a maximum range of 200 km. The missile incorporates some technology from the Russian S-300. The naval HQ-9 appears to be identical to the land-based variant. The destroyer also carries anti-ship missiles in two 4-cell launchers just forward of the hangar. It is not confirmed whether the missiles are YJ-85 or YJ-62. Unlike the launchers for previous Chinese anti-ship missiles, the Type 052C launchers are cylindrical rather than box-shaped. Missiles are guided by a Russian MR331 Mineral-ME (NATO codename "Band Stand") fire-control radar atop the bridge and a "Light Bulb" datalink forward of the hangar. The MR331 Mineral-ME is also used on Sovremenny-class destroyers to guide 3M80 Moskit cruise missiles. The main gun is a Type 210 100 mm naval gun, derived from the French Creusot-Loire T100C, in a turret with a reduced radar cross-section design. It may engage surface targets, aircraft, and low speed missiles. The maximum rate of fire is 90 rounds/min. The gun may be laid automatically or manually. It is possible, but unlikely, that the Chinese laser-guided projectiles are in service with the gun. Infrared-guided projectiles are another possibility, but a single-feed design would reduce the rate of fire if mixed with unguided projectiles. Close-in defence is provided by two seven-barrel 30 mm Type 730 CIWS, one mounted forward of the bridge and one atop the hangar. Each gun has a maximum rate of fire of 4,600~5,800 rounds/min. Two triple 324 mm (13 in) torpedo tubes are carried and may launch Yu-7 and ET52 light ASW torpedoes. The Type 726-4 decoy launcher system on the forward deck may fire ASW rockets, although this is not normally used. The digital and solid state Type 726-4 decoy launcher system is mounted on the forward deck and consists of four launchers. Each launcher has 18 tubes arranged in three six-tube rows. Firing is typically controlled automatically by the combat data system, but a manual control console is also provided. The decoy launcher system may theoretically be linked to other subsystems, although whether this feature is incorporated in the Type 052C is unknown. The primary role of the Type 726-4 is to launch chaff and decoys. However, atypically, it may also fire ASW rockets (against submarines, torpedoes, and frogmen), and even be used for shore bombardment. The launchers on the Type 052C appear to be manually loaded; automatic reloaders exist for the Type 726-4. The Type 052C may also carry the possible Israeli-derived NRJ6A ESM system. ECM missions may also be carried out by onboard UAVs. The ship is the first Chinese ship with a multifunction Active Phased Array Radar with four antenna arrays, with a reported name Type 348 Radar. China originally imported a Ukrainian C-band active phased array radar for evaluation, but decided that the radar did not meet the Chinese requirement. Instead, China adopted a domestic S-band multifunction active phased array radar with four antenna arrays. The radar is developed by the Research Institute of Electronic Technology (also more commonly known as the 14th Institute) at Nanjing, Jiangsu province, and it is a successor to the 14th Institute's earlier developed Type H/LJG-346 SAPARS (Shipborne Active Phased Array Radar System) that was completed in 1998. However, under an earlier but completely different contract, Ukraine did provide cooling technologies for the antenna to China. According to many Chinese claims on the internet, the name assigned for Type 348 radar is Sea Lion, but others claim the name only applies to the export version. The same Kavant Design Bureau of Ukraine that had provided China with cooling technologies for the radar antenna earlier also provided technical expertise in integrating the active phased array radar with ESM and the anti-stealth radar with Yagi antenna, which in turn, is a successor to the earlier Type 517H-1 (NATO codename: Knife Rest) long-range 2D air search radar. This metre-wave radar operates in the VHF band and is designated as Type 517M by the Chinese. Like the Type 348 Radar, this radar is also totally by China, and Chinese claim that it has better performance than the similar land-based JY-27 radar, which its accuracy is 150 meters for distance, one degree for angle, and its maximum range is 330 km. Type 517M radar, in contrast, has a maximum range of 350 km, but China has not released the details of its accuracy. 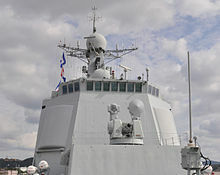 A Russian MR331 Mineral-ME (with NATO reporting name Band Stand) fire-control radar (for anti-ship missile and for the main gun as its secondary mission) was capable of over the horizon targeting, and it has been installed on other newly built PLAN ships including Type 054A frigate. The Type 344 Radar is installed to provide fire control for the main gun, and for the Type 730 CIWS as its secondary mission in case the locally mounted fire control radars for the CIWS malfunctioned or damaged in battles. Two locally mounted LR66/TR47C radars derived from Type 347 Radar provide fire control for the Type 730 CIWS, and although these radars are also capable of providing fire control for the main gun, it is not known if such capability has been incorporated via the combat data system. Type 364 Radar is installed in a radome for air and surface search, and this radar acts as a supplement of the Type 348 Radar and as a provider of target information for SAM and CIWS, while also have the anti-ship missile targeting as its secondary mission. The OFC (Optical Fire Control) -3 electro-optical fire control system is a modular design that consists of a laser range finder, a color TV camera, and an IR camera, and the laser range finder can be replaced by a laser designator (for the laser beam riding SAM), the TV camera can be replaced by a night vision camera, and the IR camera can be replaced by an ImIR, at higher cost. Development to incorporate the dual band IR, night vision camera, and the color TV camera has been successfully completed, but it is unclear if these newly developed versions will be installed on any of the ships. The OFC-3 optronics is designed by the Central China Optronic (electro-optical) Research Institute. Although the advanced versions have been successfully tested, only the most basic version have been installed on board Type 052C class, as acknowledged by the developer, and domestic Chinese media rumored the main reason was to reduce the cost. However, the adaptation of the most basic version of OFC-3 results in great decrease in the performance and effectiveness of the main gun, because without the laser designator needed, laser beam riding and semi-active laser guided projectiles can not be deployed for the Type 210 100 mm naval gun. The JRSCCS integrated command and control system is used to direct both the OFC-3 and IR-17. In addition, the system can also be used to direct all on board weaponry and sensors, though as only an emergency backup measure for the combat data system, which JRSCCS integrated command and control system is linked to. The JRSCCS system is full automatic and only require a single operator when necessary. The operator console of the JRSCCS is designated as JRMC and consists of two multifunction color displays and a joy stick, and up to five JRMC consoles can be deployed when required. According to the developer, such five consoles arrangement as the emergency backup of combat data system is located separately from the main combat information center where the combat data system is located to ensure survivability, but it is not known for sure if this configuration had been adopted for Type 052C destroyer. Like the H/ZBJ-1 combat data system on board, the JRSCCS is distributed and redundant and reflects both Russian and Western influence. From the Russian/Soviet tradition, each sensor handles as much of its own data processing as possible. While this potentially allows the design of individual system components to be simplified, the Chinese followed the Western tradition by ensuring central components can still process all information from the sensors in the event of sensor hardware malfunction. The cost of such redundancy is such that half the price of the ship is in its C4I systems. Another Western design tradition incorporated was the use of an open architecture software design. Unlike the Sovremenny class destroyers, the ASW weaponry on board Type 052C destroyer is mainly for self-defense and the ship is equipped with SJD-8/9 medium-frequency hull-mounted active–passive sonar, which is a development of French DUBV-23 sonar. The improvements in both the hardware and the software over the original French design enabled the sonar to be used as a torpedo approaching warning system as well. When in active mode, the range of the hull-mounted sonar is at least 12 km or greater, and when in passive mode, the range is at least 60 km or greater, a 20% increase to the 50 km maximum range of the Russian–Soviet MGK-355 Platina sonar on board Sovremenny class destroyers. Encrypted underwater telephone and other communication systems are installed on board to enable this class to coordinate with submarines in joint maneuvers. Although both variable-depth sonar such as ESS-1 medium-frequency VDS (the Chinese development of French DUBV-43 VDS) and H/SJG-206 linear towed-array sonar were successfully tested on board, these were abandoned because incorporating these extra sonars would lead to significant redesign of the hull and increased cost. While extra processing capability is reserved in the combat data system for the towed sonar and VDS when needed, it is highly unlikely that the towed sonar and VDS will be incorporated in the near future. The high-frequency obstacle/mine-avoidance sonar once originally planned to equip this class failed to materialize due to the same financial concern of reducing the cost. Two models of airborne dipping sonars can be carried by on board Ka-27 helicopters, both being the derivatives of Russian / Soviet V-3 medium frequency (MF) Ros' sonar (also known as Rys, with NATO reporting name Lamb Tail), with a range around 7 km. Original sonars on board Ka-27 were Russian VGS-3K models marketed by Morfizpribor, while Chinese military enthusiasts have claimed (but yet to be confirmed) that H-3 models of Ukrainian firm Sokol is also purchased by China to diversify supplier sources. Unconfirmed claims by Chinese military enthusiasts also suggest that Russian firm Morfizpribor is actively marketing its 180 kg class Vesta-K low frequency (LF) airborne sonar to China as an upgrade to the original VGS-3K Ros' sonar, which would significantly boost the performance by increasing the range by tenfold to 50 km, and with greater operating depth to 700 meters. However, the drawback of Russian–Soviet airborne sonar is that the information gathered cannot be processed on board the aircraft, so the process in done on board the ship instead. In contrast, the French Thomson-CSF-built HS-12 used on ASW-configured Harbin Z-9s has a range in excess of a dozen kilometers and information gathered can be processed directly on board the helicopter. During upgrades, HS-12 sonar was subsequently replaced by the Chinese copy of French HS-312 sonar, which is an improvement of the original HS-12, with added capability of processing extra information of 4 to 8 sonar buoys, in addition to information of HS-12 sonar itself. This Chinese version of HS-312 sonar was also installed on Changhe Z-8 during latter's upgrade. According to Chinese advertisements released during various defense / aerospace / electronic exhibitions in the past, conversion kits have been developed for destroyers to deploy multiple UAVs. The developers of both the JRSCCS and the combat data system have claimed that their products could handle the information needed to control UAVs. However, it is highly unlikely that any long range UAVs will ever be deployed on board this class because the complete handling system to support these large UAVs would need the entire hangar, thus displacing the only helicopter on board. Chinese governmental media, however, did release photos of a variety of propeller driven light UAVs being launched from destroyers and claimed that these light UAVs could be deployed on every destroyer class currently in Chinese service, and some of the pictures have depicted some UAVs carry laser targeting pods, providing guidance for laser guided projectiles. However, as of mid-2007, it still can not be confirmed that if any light UAVs has been on board Type 052C class on a regular basis. The lack of regular deployment of UAVs on board only seems to confirm the claim that the laser guided projectiles for the main gun are not deployed due to the lack of associating guidance equipment. On August 17, 2008, another type of UAV named as Hummingbird carrying electro-optical pod were deployed on board for the successful test of a new data link developed by China Northern Co. (中国北方公司). The new data link is a two-way real-time encrypted data link designed to replace the current HN-900 data link, and it is designated as NCTDL, short for Naval Common Tactical Data Link. The new data link is claimed by many Chinese to be at least equal to the Link 16, and even comparable to Link 22, but such claims have yet to be verified by both the Chinese government and sources outside China. However, it is certain that the new data link will replace HN-900 currently in service on board PLAN ships. The ship’s stern hangar accommodates 1 Kamov Ka-28 (export version of the Kamov Ka-27, NATO codename: Helix) antisubmarine warfare (ASW) helicopter, or alternatively, 1 Z-9 ASW helicopter (Chinese version of the Eurocopter Dauphin AS 365N), and both type can carry various weapons including torpedoes and depth charges. The Ka-28 helicopter can operate in all weather conditions up to 200 km from the host ship, but its onboard dipping sonar only has half the range of the Chinese copy of the French dipping sonar on board Z-9, furthermore, it lacks the processing capability to process the information gathered, so the information has to be passed back to the host ship for processing via data links, while in contrast, Z-9 can process information gathered on board the helicopter, but with shorter range. Z-9 can process information on board because it is equipped with IPS, short for Integrated Processing System, which is essentially an airborne version of combat data system, which also is a subsystem of the combat data system on board the mother ship. Type 052C is the first warship in Chinese navy to be equipped with IPS, and after evaluation which judged to be successful, IPS is fitted to all other Z-9 helicopters in Chinese navy during scheduled upgrades. Although the sensors and weaponry carried by both helicopters are somewhat comparable to their western counterparts, the overall capabilities as ASW platforms for these helicopters are seriously hampered due to the installation of their radars: unlike the western belly-mounted radars with 360-degree coverage, the radars for Ka-28 and Z-9 are chin-mounted and nose-mounted respectively, thus creating huge blind spots. In order to overcome these blind spots, Ka-28 and Z-9 must fly in very complicated flight patterns, resulting in significant fuel consumption, thus decreasing the endurance and range in comparison to western ASW helicopters. In addition, the capabilities of both type ASW helicopters are also serious reduced due to cost cutting measures which resulted in deletion of towed sonar array despite successful test on board. H/SJG-206 linear towed sonar array has a range of in excess of 100 kilometers, and abandonment of this effective ASW gear means that the defense perimeter of Type 052C is shrunk more than 100 kilometers, and Z-9/Ka-27 must loiter closer to the mother ship to fill that gap, thus cannot be deployed to the further away from ship like their western counterparts. Such limitation would lead to potential threats being much closer to the mother ship than that of the west, exposing Type 052C in greater danger to attacks in comparison to western ships equipped with towed sonar array, hence greatly reduced the overall effectiveness of the ship/aircraft performance. ^ "Aircraft Carrier & Destroyers". Chinese Military Aviation. 24 Oct 2011. Archived from the original on 2011-11-02. Retrieved 26 Oct 2011. ^ a b "Type 052C (Luyang-II Class) Missile Destroyer". SinoDefence.com. 28 Feb 2009. Archived from the original on 2011-09-02. Retrieved 26 Oct 2011. ^ "Changchun' warship commissioned to PLA Navy". People's Daily Online. 5 Feb 2013. Retrieved 22 Mar 2013. ^ "张学军副市长赴海军"郑州舰"慰问考察". Government of Zhengzhou. 11 May 2012. Archived from the original on 16 May 2012. Retrieved 12 May 2012. ^ "市委副书记雷杰会见韩旭东大校一行". Government of Jinan. 8 May 2012. Archived from the original on 2 January 2014. Retrieved 8 May 2012. This page was last edited on 17 August 2018, at 19:45 (UTC).